We are a full-service engineering company that provides service in and around the Toronto, ON area. Engineers are heavily involved in a majority of industries. From tech products to automobiles, airplane parts to structures, engineers play major roles in designing and creating products and components that are safe, functional, and improved. Many organizations around the world rely on an engineering company to provide consulting and other services for their products. At Belanger Engineering, we are a full-service engineering company that provides service in and around the Toronto, Ontario area. Our staff members are experienced and knowledgeable engineers across various specialties, including mechanical, structural, electrical, and more. Our founder and owner has more than two decades of experience in the engineering industry. He has evaluated and worked on structures, bridges, pavement, and more, and he has considerable experience in the field of concrete technology. As a result, our engineering company is one of the top in the area when it comes to designing areas where concrete will be poured, especially in commercial and industrial settings. Our engineering company is always looking to hire experienced engineers who want to expand their horizons. 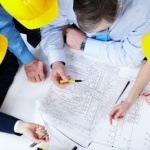 When our company started, we focused on structural and civil engineering. As we have grown and expanded with satisfied clients, we have been able to add mechanical and electrical engineering services as well. If you are looking for an engineering company to provide assistance with your next construction or renovation project, don’t hesitate to contact us for more information and an estimate. You can also check out our current job openings to pursue a career with us at Belanger Engineering. There are a number of reasons why you might be looking at engineering companies. Perhaps you own a construction business and need a trusted partner to design structures of all different shapes, sizes, and functions. At Belanger Engineering, our engineering company proudly serves Toronto, GTA, Mississauga, Markham, and Ajax, Ontario.